Social engineering is the act of manipulating people into performing actions or divulging confidential information. It is usually committed using technology. Unlike hacking, which only uses technology to seek the weak points in a system, social engineering uses both technology and people. The belief is that people are the weak points in a system. And in many cases, that assertion is correct. Two common examples of social engineering are phishing (the use of fraudulent emails or websites to acquire private information such as passwords or credit card details) and the Facebook Western Union scam (where someone chats you via Facebook saying they are in London and asks you to wire them some money). Last year, Thomas Ryan, co-founder of Provide Security, was able to get a fair bit of sensitive information from information security, military and intelligence personnel using a fake profile of an attractive & flirty young woman named Robin Sage. Although a few people realized her profiles (on Facebook, LinkedIn and Twitter) were fake, there was no central place for them to warn others. More recently, the hacker group Anonymous made headlines by breaking into the HBGary Federal website and (now former) CEO Aaron Barr’s email account. They did this using a combination of social engineering and hacking. Despite HBGary’s high profile in the security industry, they were undermined by fairly basic psychological and technical exploits. If a professional security firm had such leaks, imagine how many security vulnerabilities exist with the average Internet user. In this age of social media, I can only imagine this kind of social engineering occurring more and more frequently. Anyone armed with Robert Cialdini’s book Influence , an Internet connection, a little ingenuity, a lot of time, and an insidious motive could craft a social media scam nowadays. People are falling for them all the time. The last option could be turned into a viable business too (wink wink), if implemented reliably. That’s perhaps easier written than done though. There’s no question that social media is becoming more pervasive. In such an open society, there will certainly be people who will try to take advantage of others. And hopefully, there will be organizations (for- and not-for-profit) that will protect the people from such predators. Raise your hand if you carry your mobile phone with you everywhere you go. Wow, look at all those hands. Not a big surprise though. On a planet with 6.8B people, it is estimated that there will be 5B mobile phone subscriptions by the end of 2010. That’s more than 70% of the world’s population. Most even carry their phones everywhere they go. It’s not just a virtual connection to friends & family, but an entertainment center and life–saving device. I’ll bet most people even find it hard to imagine a time before mobile phones. Essentially, mobile phones have become anytime, anywhere devices. And not just a simple mobile phone. A smartphone. As computing power increases and technology costs decrease, smartphones will become commodities. Someday soon, everyone will have a one. That means everyone will be carrying a lot of computing power in their pockets. Sure, there will be hardware advances such as finger recognition, improved resolutions, brain wave controls, etc. But the basic features of smartphones, the features that make a smartphone what it is today (mobile operating system, keyboard, ability to install third-party apps) will be commoditized and ubiquitous. 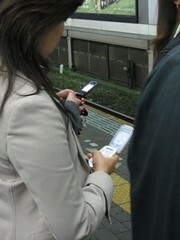 Mobile devices will offer a social 4D view of a person. Knowing a person’s latitude, longitude and altitude gives us a 3D view of their location. Adding time to this equation gives us a 4D view of their travels. We can tell where a person is and has been, much as Google Latitude’s Location History (GOOG) currently offers. Every person has several stores of social graphs: their email’s address book, their mobile phone’s address book, their social networks, and their connections on other social media sites. The one device that could harness all of those stores is a mobile device, especially a smartphone that offers email and third-party app capabilities. If we watch a person’s location over time, we can determine that person’s velocity. Plot that movement against a street and public transit map and it will be possible to determine the mode of transportation, be it by walking, car, bus, train, or boat. It wouldn’t make sense to get a notification of a nearby sale if you’re on a train, right? A history of visited locations can offer a detailed view of your preferences and behaviors. Also, how long you’ve been at someplace is just as, if not more important than where you’ve been. Will you be dining at your favorite restaurant? Or just picking up some take-out? Were you at an event (assuming we can get event data), or just using the bathroom at a convention center? An always-on location tracking service doesn’t have the benefit of a conscious check-in, so determining a location’s relevance may be a factor of time. A utility that is aware of who you email, call, text, and interact with on various social media sites – and how often – would have a vary accurate model of your true social network. Couple that with who you interact with offline, judging by who is in your same location for some length of time, and the accuracy improves significantly. There may be times when you want to run into friends and acquaintances, such as at a concert, during an industry conference, when you’re traveling, etc. A mobile device that is location-aware and socially-aware can offer this, as evident in the large number of services already doing this. The same could be done for a customer’s favorite locations or chains too, of course. People are too complexed and nuanced for a one-size-fits-all model. Products that are customizable are generally preferred. However, not everyone will take the time or know how to customize a product. That’s where products with intelligent automatic personalization will win, provided they offer the ability to adjust, refine, and opt-out. Having a social 4D awareness of a person will equip a product with the intelligence for such features. Having this depth of knowledge means preferences can be inferred. If you travel to a new city that has your favorite restaurant, we can suggest it to you. Or if friends with similar tastes have frequented a restaurant in that new city, we can suggest that too. Same goes for movies, hotels, products, etc. In addition to external suggestions, internal suggestions of features within a product or service can also be made. This depth of knowledge doesn’t only offer preference inferences, but behavioral predictions as well. If you tend to attend sci-fi movie premieres, we can offer a range of related activities based on that predictive inference, such as upcoming sci-fi movies, nearby restaurants, nearby friends with similar interests, etc. Or a nearby landmark that was used in the movie, if you’ve visited landmark sights in the past. As you can imagine, any device or business entity holding this much intimate data about a person raises serious privacy concerns. Can you trust that entity to treat this data with respect? Will they offer reliable ways to opt-out and erase this data if you so choose? Although some companies have mismanaged their privacy controls, I believe there is tremendous value to be had with predictive features. This assumes we handle your data with respect, offer total transparency, maintain crystal-clear communications, provide opt-out and deletion controls, and follow the Bill of Privacy Rights for Social Network Users. P.S. The scientific side of me knows the label 4D isn’t entirely accurate because time isn’t considered the 4th dimension anymore. The marketing side of me realizes that most people don’t know this and still consider the 4th dimension as time, however. So for ease of understanding, I opted for the older definition of 4D.